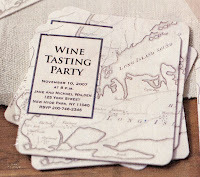 These coasters would be the perfect craft project to add to the tablescape. You can add all the party information and have them as keepsakes. But don't stop there! You can modify the theme for any type of event. Can't leave the "icing" off the cheese tray! ...little chalkboard cheese markers (sold here) or you could make your own. Chalkboard paint is sold at every craft store now and little mini frames are easy to come by too!